How you view your customers, your team, your consumer’s experience, and your priorities is about to change. The Power of YES! in Innovation encourages you to navigate your business with a renewed and deeper understanding of the benefits of innovation and the enthusiastic embrace of every opportunity. It will enable you to reconsider why you say NO! And more specifically, why you are not capitalizing on happenstance, chance and upward trajectory due to narrow and reactive thinking. Use The Power of YES! in Innovation to shift your mindset and impact your business, partners, and customers in ways that will forever alter your course and growth. These are the stories of what happened when Shawn Nason and Stephan Junion approached every conversation and interaction with the commitment to say YES! 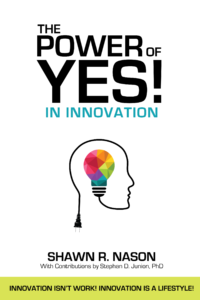 Renowned healthcare and business catalysts, the former Disney Imagineer and business doctor, broke open the enlightening truth of their organization’s status and path simply saying YES! and exploring every hidden fortune through deliberate innovation. This project would not have happened if it wasn’t for the amazing guidance and push from Cathy. She was not only a coach and strategist, but many times she was the one driving us to meet deadlines. This book would not be here today if it were not for Cathy! To purchase your book, follow this link.